The name of this annual event could be “One Night Only — Sold Out” because that’s what the signs say every year, and last week was no exception. Creator, producer, and genius-in-charge Michael Childers brings about two dozen of his Hollywood and Broadway friends into town for three days, two parties and two rehearsals at the McCallum Theatre. He gives them a theme, such as this year’s “Back To The Sixties” and they take it from there, applying their Tony-, Oscar- and Emmy- winning talents to select one song that fits the theme yet showcases their individual talents. It never fails. More importantly, it never fails to generate much-needed funding for Jewish Family Service of the Desert. And JFS stretches every dollar serving 5,000 clients a year regardless of race, income, religion, or lifestyle. Joyce and Henry Freund, Wendy and Bob Goodfriend, Dorothy and Melvyn Lefkowitz, Elaine and Jerry Morgan, Madeline Redstone, Bobbie and Mike Resmo, Denise Roberge, Nina and Robert Wernick, Bill Nicholson, Flooring Innovations and Agua Caliente Band of Cahuilla Indians. Among those singled out for their hard work were event co-chairs Terri Ketover andBarbara Fromm; Helene Galen and Jamie Kabler (the cast party); Mitch Gershenfeld and the McCallum Theatre; Willie Rhine and LULU Catering; Jerry Keller; and all the volunteers who worked so hard to make the event so successful. Like some other desert events which have taken on a persona and branding of their own, the ONO, in its eighth year benefiting JFS of the Desert, has grown from one night into a two-day marathon, beginning with a cast party generously hosted by Helene Galen and Jamie Kabler at Helene’s art-filled estate. What Kabler describes as “a few friends dropping in” was actually about 200 prestigious locals and professionals who enjoyed the Galen movie theater (which was showing a New York fashion video) whimsical art in every nook and cranny and — outside — a pool patio party that was suddenly interrupted by stirring music from the Palm Desert High School Marching Band. The band, complete with acrobatic drum majorettes and flag twirlers, shot the party mood skyward where a double-wing drone was circling the entire estate with flashing red and yellow lights. The next day, Childers and his cast got together at the McCallum Theater to create, rehearse, and — four hours later — perform a spectacular show, “Back to The Sixties” with a nine-piece orchestra dramatic stage lighting, and flawless timing. » Mary Bridget Davies’ performance was so reminiscent of Janis Joplin it inspired both tears and cheers. » Ann Hampton Callaway’s “Blowin’ In The Wind” brought down the house. 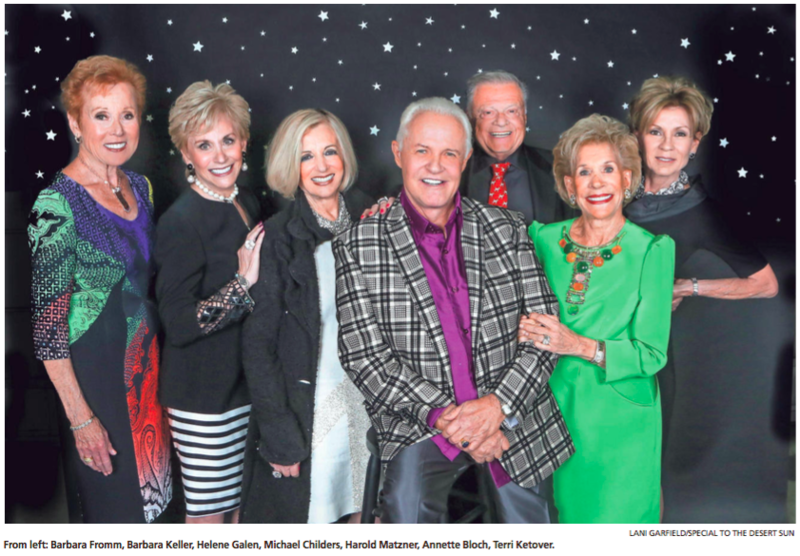 » Lucie Arnaz, talented daughter of Lucy and Desi, turned her number, “Hey, Look Me Over” into a salute to the charity, a memorial to her parents, and a proud announcement that the new musical she produced, Hazel, which is headed for Broadway. Everyone who grabbed the mic wanted to thank the show’s producer, Michael Childers, writer-director Calvin Remsberg, musical director Ron Abel, and executive producer Ken Katz. An afterparty, held in the Annenberg Center For Health Sciences on the Eisenhower Medical campus, drew about 450 supporters to mingle with the cast and talk about next year.